It would be silly if engine Knight would not be that robot Child Emperor is facing.. I hope that this bit of action does not last too long..
Sweet Mask hype and Darhshine fight is very close.. I cannot wait. Yes, the hype for Darkshine is real! 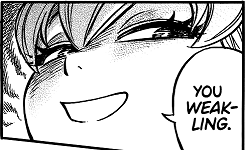 I'mm more interested in Tatsumaki situation sincd e she'll end up running Monster King. Yes that is almost certain but stronger characters does not equate with more interesting fights imo. Esper fights are boring to me.. close quaters combat is my thing. It's because I know what happens and am curious how she'll handle Orochi. I second that. Mecha scene was AWESOME and unexpected even for Web comic Veteran. Yeah, wonderful chapter. I was in awe when I saw that robot. There is probably some genius in Murata. Child Emperor continues to impress! This manga is still SO very cool. I would love to see that Mecha go against some enemies we already seen like Deep Sea King or others. Such a cool stuff. I wonder what firepower it has and if it could go against Elder Centepide for example or only against weaker Dragon level enemies. Child emperor is such a badass! I don't get why people don't like Child Emperor. Not in these forums. But like someone was calling him a smug brat. I mean. He just seems like a nice smart kid who's pretty mellow. What helps is the hostage ( who wasn't in the original ) who is ( innocently ) smug and makes him look more modest in comparison. Just when i think that someone needs to die, enters a being with resurrection ability D:OPM is just a simple drawing catalog when Saitama isn't around, so boring. Tons of monsters have died, now you're pissed for a single monster "resurrection"? He's a phoenix, he was obviously going to resurrect stronger. For me personally straight up fight scenes aren't particularly that interesting, I much prefer the Garou or Saitama fight scenes. Even the S class hero battles are fine as long as it gives a decent view into the character and their morals etc. The best bit about speedy flash fight for me was the conversation between them of speedy killing those who sent assasins after him and the rest could have been packed into a much shorter fight and i'd be equally satisfied. Of course this is just my opinion and I know other people enjoy the fighting scenes(they do look amazing tbh) a lot. I'm fine with the slower pace and it's just a matter of personal taste so w/e. Wait, what does this mean? He's going to deliver a chapter today? ?